Welcome to JohnandKiras.com ("Web Site"). Please take a few minutes to review these Terms and Conditions. These Terms and Conditions apply to your access and use of the Web Site and our mobile applications. Your use of our Web Site or our mobile application constitutes your agreement to follow these Terms and Conditions and to be bound by them. John and Kira's LLC reserves the right to update or modify these Terms and Conditions at any time without prior notice. For this reason, we encourage you to review these Terms and Conditions whenever you purchase products from us or use our Web Site. We welcome your comments about our Web Site. However, any comments, feedback, notes, messages, ideas, suggestions or other communications (collectively "Comments") sent to our Web Site shall be and remain the exclusive property of John and Kira's LLC. Your submission of any such Comments shall constitute an assignment to John and Kira's LLC of all worldwide rights, titles and interests in all copyrights and other intellectual property rights in the Comments. John and Kira's LLC will be entitled to use, reproduce, disclose, publish and distribute any material you submit for any purpose whatsoever, without restriction and without compensating you in any way. For this reason, we ask that you not send us any comments that you do not wish to assign to us, including any confidential information or any original creative materials such as stories, product ideas, computer code or original artwork. To the extent our Web Site contains hyperlinks to outside services and resources, the availability and content of which John and Kira's LLC does not control, any concerns regarding any such service or resource, or any hyperlink thereto, should be directed to the particular outside service or resource. The prices displayed on our Web Site may differ from prices that are available in stores, outdoor markets, or in catalogs, and our pricing may differ from location to location. If you are in the U.S. or Canada Web Site prices will be displayed in U.S. Dollars. Elsewhere Web Site prices will generally be displayed in the local currency. The prices displayed in our printed catalogs are quoted in U.S. Dollars and are valid and effective only in the U.S. For sale products (identified by pricing in red), "Regular Price" refers to the most recent selling price. "Sale" refers to the reduced price we are offering to our customers. From time to time there may be information on our Web Site or in our catalog that contains typographical errors, inaccuracies, or omissions that may relate to product descriptions, pricing, and availability. John and Kira's LLC reserves the right to correct any errors, inaccuracies or omissions and to change or update information at any time without prior notice (including after you have submitted your order). If you choose to become a Member, we collect your name, address, phone number, email address, username and password. We also collect the names, addresses, and phone numbers of those persons whom you add to your personal address book as a Member. If you shop with us via Johnandkiras.com, we collect the following information about you: name, address, phone number, email address, billing information including credit card number and expiration date as well as the names, addresses and phone numbers of gift recipients (if any). We use your name, address, phone number, billing information/credit card information to process your order or as otherwise described in this Policy. From time to time, John and Kira’s may also contact you via email, postal mail, text message, or phone to conduct questionnaires and surveys. Survey information is treated like all of the information we collect. A Member can access, review and/or correct all of their personally identifiable information that was provided to us online by logging into their Account and accessing the My Profile section. You may unsubscribe from marketing emails from us by emailing support@johnandkiras.com. You may unsubscribe from our mail order catalog or other John and Kira’s mailings to your postal address by emailing support@johnandkiras.com. Please note that removal from our postal lists may take up to 6 to 8 weeks to be effective. You may send us an email at support@johnandkiras.com or write to us at Customer Care, John and Kira’s, LLC, 163 W Wyoming Avenue, Philadelphia, PA 19140. Please include your current contact information, the information you are interested in accessing, and your requested changes. We will make the changes you request or provide an explanation of what actions we will be able to make in response to your request. John and Kira’s may disclose your personal information to third parties for their use in marketing to you unless you tell us not to. In order to opt out of our third party mailings, please email us at support@johnandkiras.com or write to us at Customer Care, John and Kira’s, LLC, 163 W Wyoming Avenue, Philadelphia, PA 19140. John and Kira’s offers Users live customer service assistance. Information you provide during a call may be used to assist with your inquiry, as well as for any purpose permitted under the Policy. Calls may be recorded for quality assurance and training purposes. John and Kira’s sometimes employs other companies and individuals to perform services for us. For example, we hire agencies to help administer consumer promotions, to analyze data, to fulfill orders you place, and to provide customer service. We may share your personally identifiable information with these parties, who have agreed to hold this information in confidence, not use it for any purpose except to carry out the requested service, and honor John and Kira’s privacy and security policies in the way this information is handled. John and Kira’s takes your privacy and security seriously. For this reason we work to establish technical, administrative, and physical security measures to protect against unauthorized access or use of personal information. We cannot, however, guarantee the security of any information you send to us and you do so at your own risk. Members are responsible for maintaining the confidentiality of their password and account. Members are responsible for activities that occur under their account and should immediately notify John and Kira’s of any unauthorized use of their account. This website may contain links to websites operated by other companies. John and Kira’s is not responsible for the policies and practices of those third party sites. You should check the applicable privacy policies of the other sites you visit. If you have any questions about our Policy, you can e-mail us at support@johnandkiras.com or contact us by mail at Customer Care, John and Kira’s, LLC, 163 W Wyoming Avenue, Philadelphia, PA 19140. We'll be happy to answer your questions or hear your concerns. 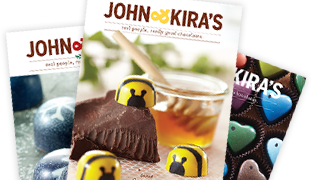 John & Kira’s Chocolate is a registered trademark of John and Kira’s LLC. All of the Content on this website is subject to copyright, trademark, service mark, trade dress and other intellectual property rights or licenses held by John and Kira’s LLC. Your use of the trademarks, service marks, trade dress and copyrighted material displayed on this website is strictly prohibited. You may download, print and store selected portions of the Content, provided you (1) only use these copies of the Content for your own personal, non-commercial use, (2) do not copy or post the Content on any network computer or broadcast the Content in any media, and (3) do not modify or alter the Content in any way, or delete or change any copyright or trademark notice. No right, title or interest in any downloaded materials is transferred to you as a result of any such downloading. John and Kira’s LLC reserves complete title and full intellectual property rights in any Content you download from this Web site. Except as noted above, you may not copy, download, reproduce, modify, publish, distribute, transmit, transfer or create derivative works from the Content.